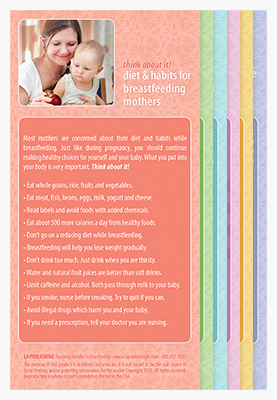 Our NEW Breastfeeding Tip Cards provide useful tips on six different topics. Each card gives parents some ideas to think about! They are colorful, helpful and priced low. 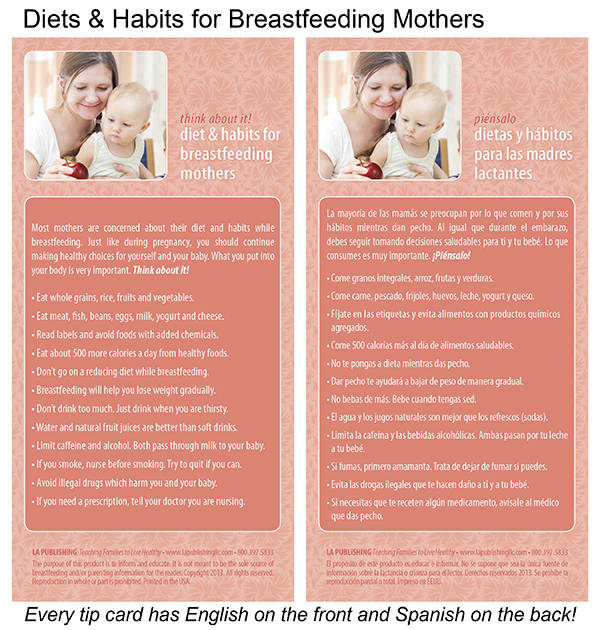 The tip cards are great as prenatal handouts or to encourage moms during follow up visits. Most mothers are concerned about their diet and habits while breastfeeding. Just like during pregnancy, you should continue making healthy choices for yourself and your baby. What you put into your body is very important. Think about it! 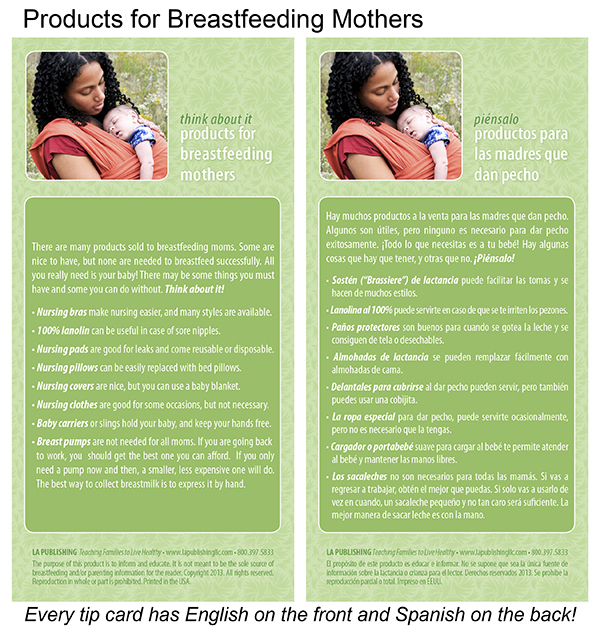 There are many products sold to breastfeeding moms. Some are nice to have, but none are needed to breastfeed successfully. All you really need is your baby! There may be some things you must have and some you can do without. Think about it! Many breastfeeding moms never have to use bottles. But if you are going back to work or school, you might need to bottle-feed part time. It’s important that you do not start too early. You should wait around 4 weeks before giving your baby a bottle. Remember, when using bottles, expressed breastmilk is always better than formula. Think about it! To collect and store milk for your baby, you must plan ahead. Set aside time. Have your supplies ready. The best time to collect milk is between feedings or in the morning. To maintain milk supply, nurse often and express milk as needed. Think about it! Many mothers worry about how a C-section birth could affect breastfeeding. You may be tired and in pain, so it might seem harder to breastfeed, but don’t give up. You can still breastfeed if you have a C-section. Think about it! Many family members worry that if mom decides to breastfeed, then they can’t bottle-feed the new baby and won’t be able to bond or help out. This is simply not true. There are many ways you can bond with a breastfeeding baby and many ways to support a breastfeeding mother. Think about it!